This past black Friday, I decided to do the smart and yet fiscally-responsible thing: shop online for electronics. Our current TV has been making weird noises that I interpret to be death rattles. So what better way to snag a big screen TV than by shopping super early on black Friday. Like a smart consumer, I did my research before hand and found Walmart.com had 2 TVs at really good prices: 47 inch LG for $699 and a 55 inch LG for $898. As soon as it was 12:05am, I logged on to Walmart.com and bummer, the 55 inch was "sold out". I settled on the 47 inch and made the purchase with an AMEX card. Why AMEX? Because they offer free extended warranty on electronics. Done with my shopping, I went to sleep. Woke up around 7am and decided to try the 55 inch again. Luckily it was in stock and I bought it too figuring I'll just return the 47 inch when it arrives. Free shipping on both TVs meant I wouldn't have wasted money on shipping the unwanted 47 inch. I was feeling very proud of myself. I had managed to snag the item I wanted for an incredibly low price. Little did I know that my nightmare with Walmart.com (I keep saying Walmart.com because this story involves the online part of Walmart) had just begun. A few hours later, my phone chirped to signal a new email. The email said my order for the 55 inch TV had been canceled. No reason given. They just canceled my TV. My first thought was "this is probably AMEX trying to protect me because they think making 2 large purchases so close together is suspicious". 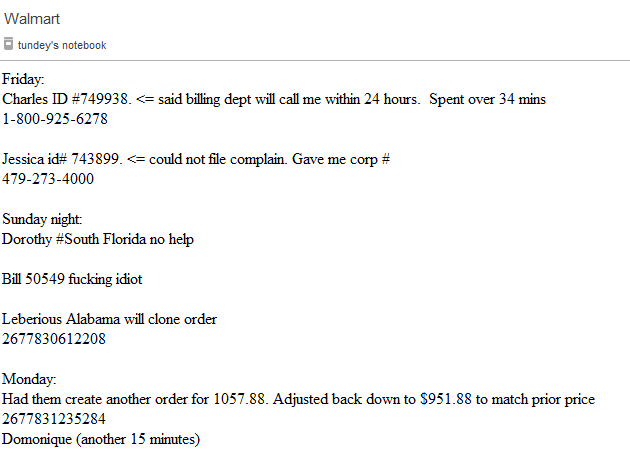 So I called them and they were like "Nope, everything is good on our end. 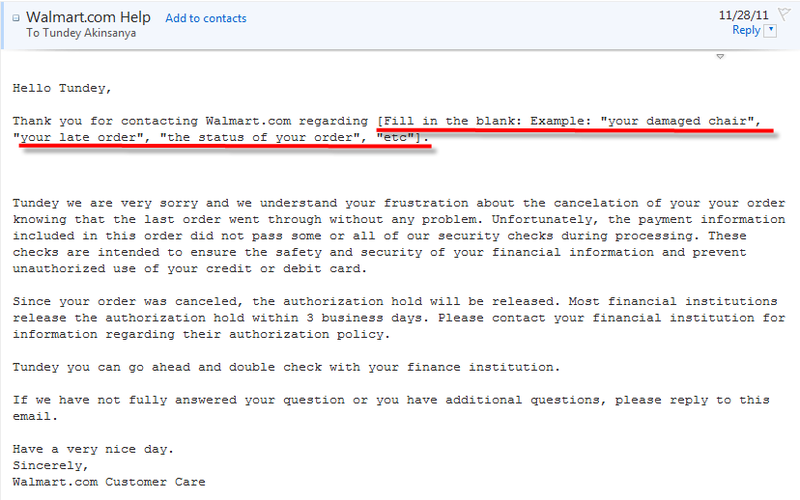 In fact, I just put through a $1000 authorization as walmart and it went through. Everything is good here." Hmmm, that's weird. 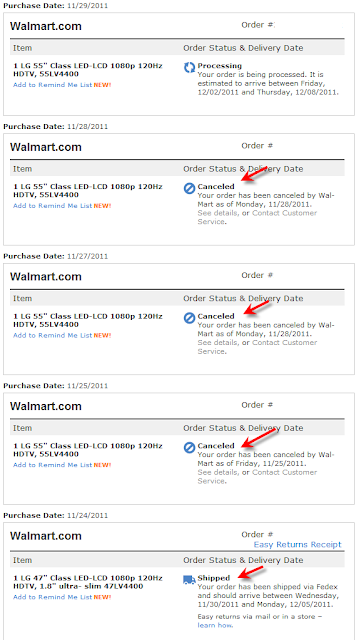 Why would Walmart cancel the 55 inch and ship the 47 inch when both orders were purchased on the same Walmart.com account using the same credit card? Makes no sense. I waited till they were open and called their customer service number. Spoke to a nice lady that essentially said "Don't worry about it. I'll fix the 55 inch order and even cancel the 47 inch to save you the trouble of schlepping it over to a physical store". Nice! Me: What information specifically, my name, address, what? Meanwhile the price of the TV has gone up by $106 and after over 7 calls and tweets to Walmart.com and hours wasted, I still don't have the TV and there are all these pending authorizations on my AMEX from Walmart. So why not just buy the damn tv from Amazon or BestBuy? Because even with price hike, Walmart is still cheaper and I like the convenience of being able to return to a physical store (imagine having to ship a 55 inch TV back to Amazon). 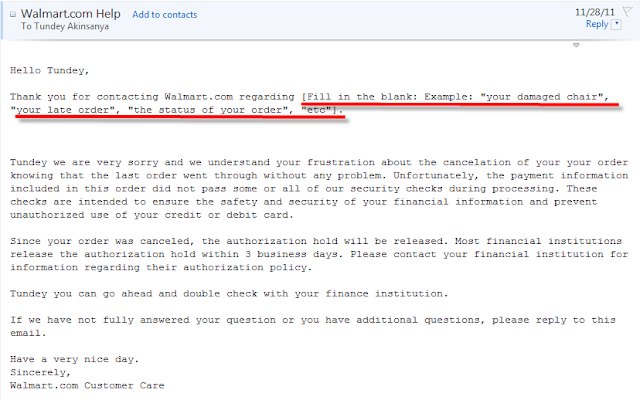 Here's a screenshot of the form letter email I got from Walmart.com when I contacted them via email. They couldn't even be bothered to replaced the placeholder text.